The rent crisis does not need a national solution. Yes, the rent is too damn high—but there isn’t one explanation and there isn’t one fix. 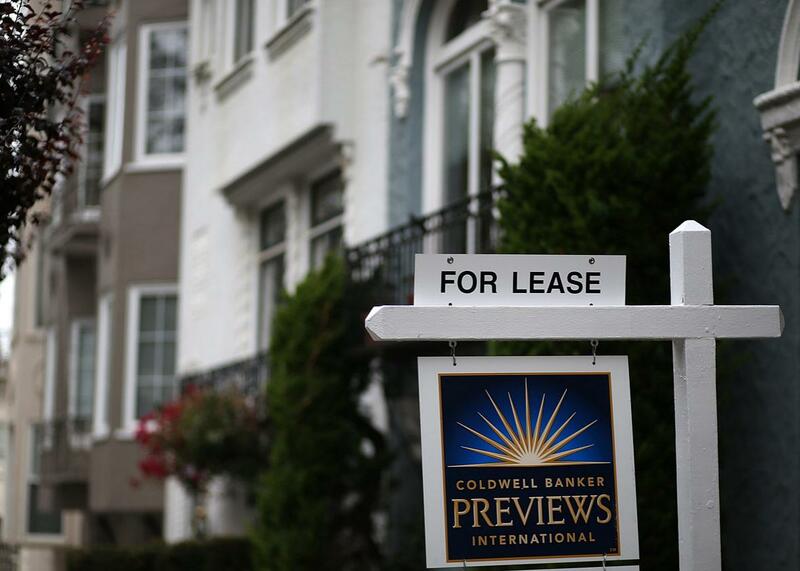 A for lease sign is posted in front of a home on April 21, 2015 in San Francisco. As the search for bodies continues at West London’s Grenfell Tower, where 79 people are presumed dead after the city’s deadliest fire since World War II, the United Kingdom is having a national reckoning about inequality, austerity, and the role of housing in the welfare state. Labour leader Jeremy Corbyn pointed to the contrast between Grenfell—located in one of the country’s poorest wards—and the wealthy surrounding borough of Kensington and Chelsea, which owned the property. Corbyn and his colleague David Lammy, the MP from Tottenham, suggested the state could requisition the borough’s vacant homes owned by overseas investors for homeless fire survivors. Thanks to Margaret Thatcher’s “right to buy” program, the proportion of Brits living in council housing like Grenfell is half what it was in 1980. But soaring rents and home prices have brought public concern about housing in the U.K. to its highest point in decades, especially for young people. Corbyn had promised 500,000 new council houses as part of a larger Labour homebuilding program; young people came out for his party en masse and propelled him to big electoral gains two weeks ago. Kensington and Chelsea elected a Labour candidate for the first time in years. NYCHA is widely considered a paragon of public housing, an enclave for service workers and the elderly in a very expensive city. The system also has an $18 billion backlog of repairs in addition to an operating deficit. “Housing conditions at NYCHA remain a tenant’s nightmare, with moldy units, holes in floors, and broken walls,” New York City Comptroller Scott Stringer said in April, announcing a brief on the maintenance concerns of NYCHA residents. The waiting list is still a quarter-million people long. The deterioration of the city’s living monument to the welfare state is part of a larger trend. The failure of mid-century public housing in most American cities discredited the very concept; the Reagan administration cut HUD to pieces. Today, rental housing vouchers—a Nixon-era project to shift government assistance away from supply—only cover one-quarter of eligible American families. Having a roof over your head is a privilege, not a right. The crisis is not confined to the American poor. Americans of all incomes have flooded the rental market, leaving the rental vacancy rate at a three-decade low and the homeownership rate at a five-decade low. Rents continue to rise faster than inflation. More than 11 million households pay half their income in rent; nearly half of all tenant households pay more than 30 percent of income in rent, the standard mark of affordability. So you can understand the sense on the American left, doing a bit of transatlantic political observation, that housing (along, of course, with health care) would be a good plank for a Democratic Party that doesn’t presently know what it offers. On this subject, the party’s 2016 platform was lackluster. It called, of course, for proper funding for housing assistance, but made no mention of the national rental affordability crisis—or that all-out efforts to juke the homeownership rate knocked out the world financial system. Then, too, progressives thought housing should play a larger role. Now, those calls have returned—and will intensify as the 2018 midterms begin. America is still in the midst of an affordable housing crisis, yet it's rarely discussed in national politics. Could be a winning issue. In Britain, a campaign and a tragedy are demonstrating that decades of disinvestment in public housing have created a constituency for it. In America, the attempted promotion of a Trump family party planner shows how much daylight lies between the administration and reality on housing. Why not, at this pivotal moment, make the right to shelter part of the social contract? The short answer is that rental affordability is not, despite appearances, a national problem. It’s two separate problems—one with rent, and one with income—that look like one. Solving the former without addressing the latter would make America more unequal, not less, because the cities that need the most help with rent also have the highest incomes. Zillow has a measurement called the Rent Affordability Income Gap, or RAIG, which shows what kind of raise (as a percent) a worker would need to bring his or her share of income spent on rent back to the 1985–2000 level for that city. It’s a proxy, essentially, for how much worse things have gotten in the past 20 years—and in that sense, for how likely a voter might be to consider high rent a top political issue. The top 10 cities for RAIG include some classic high-rent coastal cities, like San Jose, New York, Miami, Washington and San Francisco—but also Jackson, Mississippi, New Orleans, Nashville, and Little Rock, Arkansas. Sun Belt foreclosure mecca Orlando is No. 11. It is tempting to walk away from it with the idea that rent would be a winning issue. But that would obscure an enormous difference in the two types of cities. The income gap in New York, San Jose, San Francisco, and Washington is more than $40,000. In all the others, it’s under $30,000. It’s a difference in kind, not degree, and one that reflects the split between cities where the problem is high rent and cities where the problem is low income. Twice this spring I found myself at conferences on housing—once in Cambridge, Massachusetts, and once in Charlottesville, Virginia—where this dichotomy was revealed. In Cambridge, I was listening to Chris Krehmeyer, the president and CEO of Beyond Housing, a community development organization in St. Louis, explain the problem in St. Louis—which, by the way, falls about right in the middle of Zillow’s RAIG list. “Our dilemma is not affordability,” Krehmeyer said. “We have a pretty significant single-family rental portfolio, three-bedroom single family homes, 1,200 square feet, that we rent for $675. Affordability is not an issue.” The crowd, made up mostly of big-city journalists, gasped audibly. A couple months later, after a panel on affordable housing at Charlottesville’s Hometown conference—which featured representatives from Charleston, South Carolina (the national capital of gentrification) and Madison, Wisconsin (home of the University of Wisconsin)—an attendee from Syracuse, New York approached to say, politely, that the content of our panel had struck him as totally irrelevant to the situation in Syracuse, where he was having trouble finding tenants for his rental properties. An average two-bedroom in Syracuse rents for $754. Which raises the question: Why should boosters of Syracuse and St. Louis, two cities with declining populations, support more subsidies for tenants confronting sky-high rents in San Francisco and San Jose? Why should they even support public housing in those metros, where land and labor costs will inflate construction budgets? Why should they support higher per-capita assistance to tenants in coastal metropolises where housing is expensive in part because of land use restrictions designed to protect housing wealth? American migration is not a zero-sum game, but in the fight against brain drain and population loss, one advantage second-tier cities and small towns have is their cheap housing stock. Any kind of federal policy that helps tenants make rent in high-cost cities is going to constitute a big influx of cash into the most moneyed parts of the country. That’s not to say that a progressive, federal platform on housing isn’t possible, especially for the poorest Americans. Section 8 vouchers, for example, could probably be fully funded by rescinding the mortgage interest deduction—a change that would create a transfer of wealth from high-cost city homeowners to high-cost city renters. Federal policy could be adjusted to make multifamily housing and mixed-use developments easier to build, and better fund urban transportation. States could also do much of the legwork themselves through land use reform, progressive tax policy, tenant protections, and Fair Housing Act enforcement. But with a government organized by geography, it is difficult to argue that a renting family in Los Angeles making $600 a month deserves a subsidy four times that of a family in Memphis. The largest source for project-based affordable housing, the Low Income Housing Tax Credit, avoids this issue by allocating credits based on state population—a system that both ensures widespread political support and limited impact in markets with huge housing shortages. The battle, as ever, is between two largely opposed aims: helping people get out of struggling places and helping those places succeed. Economists argue the higher subsidy for high-cost markets is worth it since those places are more productive, and they are places where people can find good jobs and move up in the world. But for Syracuse, more federal money to help pay the rent in New York City is like getting paid to move out.